It Is What It Is: Do Me a Favor? Hey friends! I'm hoping you can do me a favor. As 2012 gets into full swing, I'm trying to scrutinize my schedule and try to add in some activities that used to be important to me (hello, treadmill!). While this blog has become important to me and, I hope, a highlight for you, it is difficult to know how many of you are stopping by on a regular basis. If you enjoy the blog, would you please click the cute little "Join this Site" button on the right? Before I prioritize the blog above weight loss, I'd like to know that there are more than 15 people reading each day. I love all 15 of you, but you can't help me drop 20 pounds. I'll be back later this afternoon with another post jam-packed with more Cael and Graham craziness, but I do appreciate your help with this. If you're unwilling to join the site, you're always welcome to come change diapers at my house. I'm not picky. It looks like you have 43 people who read in google reader, including me! personalmap - Thanks so much! It's really hard to know if anyone is out there sometimes! Mary, I read your blog everyday, and introduced to my mom as well! Its my first break of my work day, reading what your little ones are up to! I am waiting for the book to come out, seriously! Shae- I'm so glad you and your mom both like it! I sometimes check twice a day to see if you have updated anything!! Write a book!!! I'll buy 10 copies for my friends! Thanks Maggie and Judy! I appreciate the comments- it gives me the boost I needed to keep the stories coming! Hi Mary! I hav fallen in love with your blog and look forward all the time to reading a new entry!!! Looks like all is well with you and your family. Say hi to Joel for me!! hi Mary! Im from Srilanka and i have a 7 month old daughter. i came across your blog last year and i always check for new entries daily! i just love the way you write and i adore your sons! your blog has helped me to enjoy motherhood more! Looking forward to reading more! Hugs to Cael and Graham! Erin- Thanks so much! I'm glad you like it. I felt badly asking people to join, but it does give me a good idea of how many are reading. I love writing, so I guess I'll keep them coming! Shaz- Thanks so much for writing! I think it's so cool that people are reading from all over the globe. I hope you'll keep coming back! Heyya! Just came back to check on your blog, again! You can count on me to keep coming back for more! My mornings are incomplete without reading atleast one Poop-y post from your blog! I am leaving for a 3 month trip to India, but trust me, I will keep coming here to catch the latest on you guys everyday! I read your blog almost daily as well! Love reading all of the funny things your boys get up to. 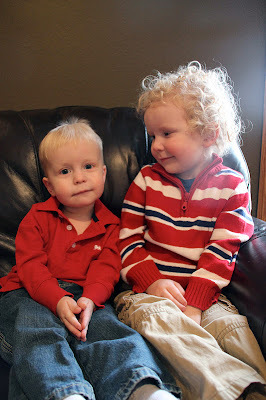 I have a 4yo who would get along really well with Cael - lol. We're all the way over in Australia! All the best, look forward to reading many more posts! I too read your blog daily and love it! Your boys are gorgeous and I giggle out loud at your tales of their antics. P.S You're collecting a diverse readership...I'm in Kenya! Pavi- Wow, that's a big trip! Safe travels and thanks for reading! Katrina- I'm always glad to have you! I'm always happy to have other moms on board with little ones in tow... we need to commiserate with each other! Gem- Kenya, wow! That is SO cool! Thanks for reading- I'm glad to have you!